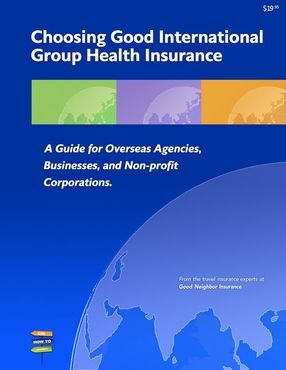 HOW TO CHOOSE GOOD INTERNATIONAL HEALTH INSURANCE. A GUIDE FOR GROUPS CONSIDERING, OR CHOOSING BETWEEN, PLANS OR CARRIERS. Choosing Good International Insurance does not need to be hard. It can be easy IF you know the right things to look for and the right questions to ask. This free guide is in .pdf eBook format and is available for download only. A confirmed email is required for delivery. An email with the link to the book will be sent to you immediately upon clicking “Get it free” above. Sometimes it is helpful to check your ‘junk mail’ if you do not see this email from us. The Acrobat .pdf reader is available for free here. “One clear advantage to small organizations is choosing a good group insurance policy. Larger non- profits can have a harder time getting a large number of employees to agree since generally they may be happy with their coverage, even if they end up spending more money t han they have to. Secondly, often more workers may mean more time needed to qualify due to pre-existing conditions and gathering pertinent medical data. But, if the non-profit starts group health coverage when small, even as small as two or three workers, then when new employees are hired, they and their families are automatically are accepted into the health plan with no preconditions, so the two problems listed above are overcome. New workers that may have to raise a portion of their own support will also know an exact amount, making it much easier to budget. Administrators and personnel departments also save hundreds of hours tryng to keep track of various policies to make sure they are adequate and that workers will be provided for in case of emergency. Note: The information provided in this free guide was written for groups. Good Neighbor does not take any responsibility for individuals trying to use the information to make personal buying decisions or to compare polices or plans. If you are an individual looking for good international health insurance, call us for help choosing from among our wide selection of carriers and plans.